"The Baschet brothers are known worldwide as creators of Sound Sculptures, fantastic shapes of moulded metal and glass, which combine the visual arts with music. François Baschet had always been fascinated by acoustics, by the relationships between the shape and material of an intrument and the beauty of its sound. 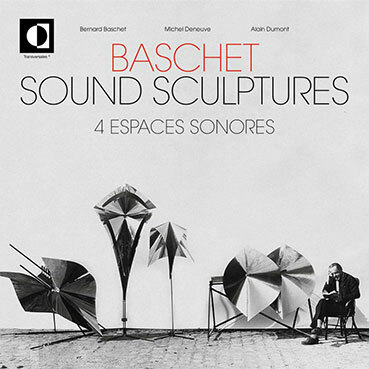 Bernard Baschet was passionately interested in contemporary music and firmly believed that such instruments were the proper tools for modern music, for they offered to the artist and performer a personal means of expression denied by electronic devices. Together the brothers began to design and produce Sound Sculptures, which could also be regarded as musical instruments. Circa 1965, Bernard worked alongside Pierre Schaeffer as a member of the GRM (Musical Research Group) on the elaboration of what was to become Schaeffer’s "Traité des objets musicaux" (Treatise on Musical Objects). The Baschet brothers also created structures and instruments of all sizes, including bell towers, windmills and fountains, using the natural elements of wind and water to make music. Bernard Baschet was especially proud of his pedagogical work amongst deprived and handicapped children, with the instrumentaium made up of fourteen pieces."